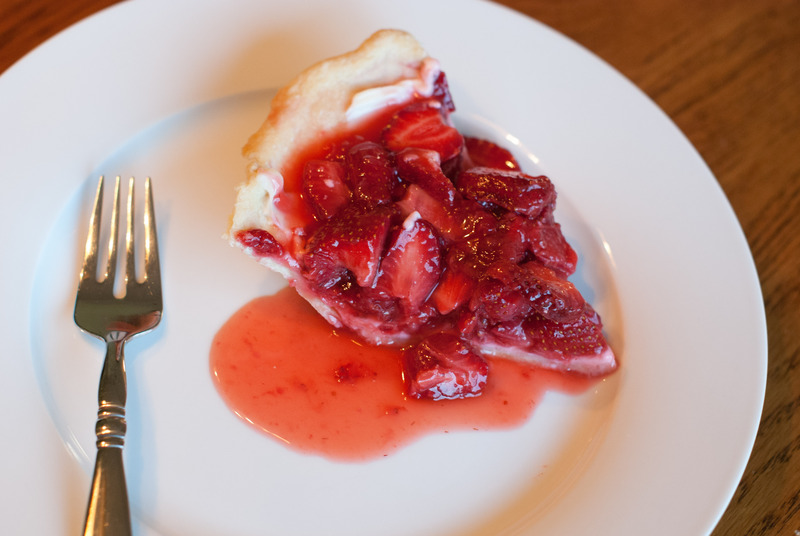 Strawberry pie is one of my family’s summer food highlights. Usually the first summer fruit in for the season, in late May I start trolling the farmer’s market for the first cartons of berries. While I am and forever will be a Cake Person, James is a Pie Person. And since he is my favorite person to cook for, I try and make a lot of pies in the summer. I started with a family recipe from my mother in law and tweaked it a bit. Whip cream cheese and powdered sugar with electric mixer until smooth. 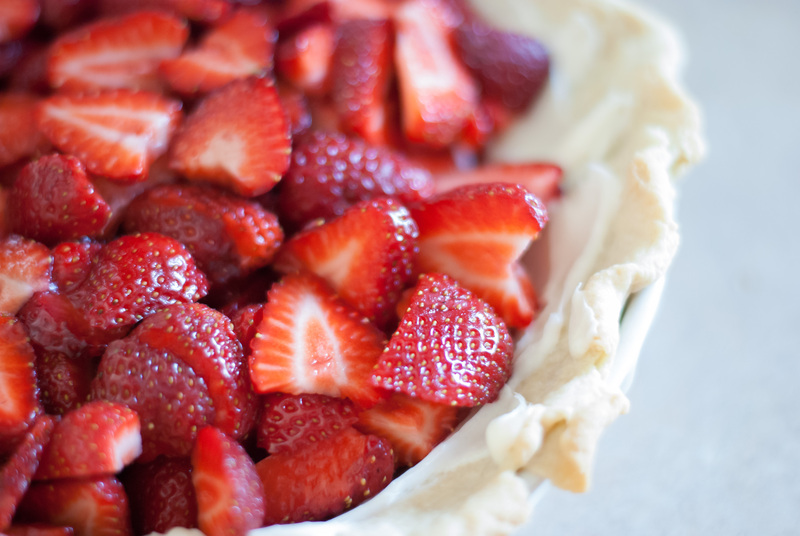 Spread over the bottom and sides of a cooked and cooled pie crust; set aside. 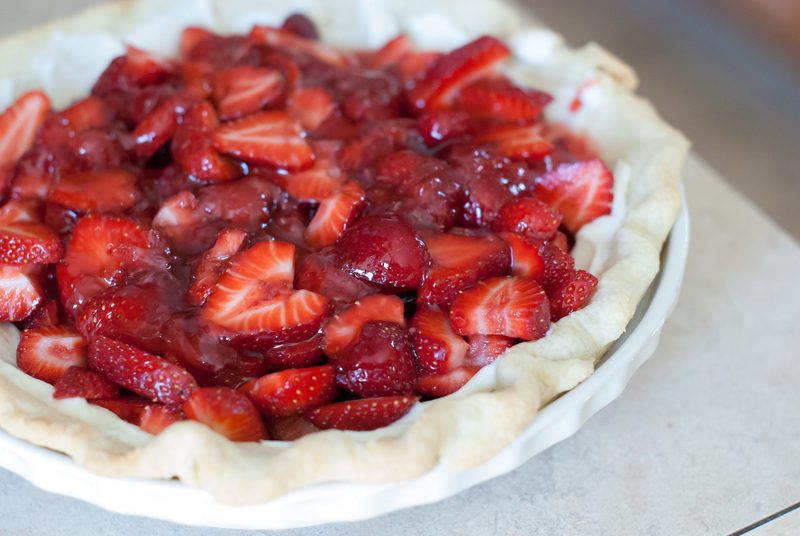 Slice strawberries and fill pie crust except for ~1 c. Mash 1 c berries and mix with sugar, corn starch, and water or juice in a saucepan. Boil for ~ 1 minute, let cool slightly, pour over strawberries and chill. Use metal blade of a food processor to process flour, butter and salt until mixture is like coarse meal, about 8 seconds. Add ice water and pulse until dough begins to clump together. Divide the dough into 2 balls [original recipe divides into 3 crusts, I find that stretched too thin, so I make 2 crusts with the same amount of dough, YMMV] and put into a plastic bag, work the ball through the bag into a ball, then flatten into a disk. Refrigerate. Roll each disk of dough on a lightly floured surface into a circle about 1/8 inch thick. Press into pie pan. Fold over the overlap of dough into a decorative edge. Prick bottom and sides with a fork and refrigerate for 30 minutes. Preheat the oven to 400 degrees. Line pie shell with parchment paper or foil and fill with uncooked beans, rice or pie weights. Bake for 12 minutes. Remove paper and weights, Bake 6 minutes longer or until slightly browned. Note: Admittedly I do not always refrigerate the dough as long as recommended and if I’m feeling particularly impatient sometimes not at all.